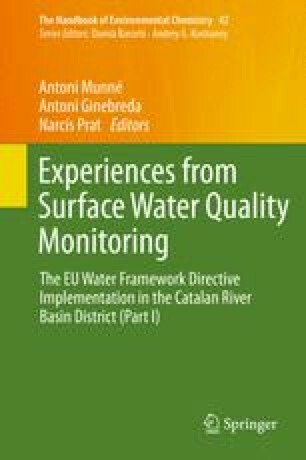 In this chapter we review the implementation of the Water Framework Directive in Catalan large reservoirs and the impact of the first Program of Measures on the ecological quality of these water bodies. In this case, the implementation faced a big challenge, resulting from combining a reduced number of water bodies located on highly heterogeneous geological setting and suffering from different and contrasting human impacts. This chapter introduces the proposed methodology, later assesses how it was implemented in a simplified assessment, and finally makes some suggestions for future improvements. In our opinion, a simplified protocol firstly used in Catalan reservoirs for the assessment of ecological potential is a sound, scientific-based methodology that delivers useful information for tailoring the Program of Measures to realistic and achievable objectives. As potential improvements we suggest: (1) the protocol to assess ecological potential should consider the one-out all-out rule for combining the biological and physicochemical quality elements; (2) definition of water body-specific Maximum Ecological Potential situations, using the Alternative Prague approach; (3) update the boundaries between levels of ecological potential inside each typology using the best knowledge available from reservoir limnology studies, particularly those published during the last decade; and (4) including the presence of invasive species in the assessment of biological quality. We are indebted to all people involved in the first study on the application of the WFD in Catalan reservoirs: L. Caputo, J. Carol, L. Benejam, and E. García-Berthou. We also thank S. Poikane for valuable discussions on the convenience of including introduced fish metrics in the assessments. The original research was funded by the Catalan Water Agency (ACA), which also provided historical data for the reservoirs and current assessments. We also acknowledge the support provided by projects CARBONET (Spanish Ministry, CGL201130474C020) and SCARCE (Consolider-Ingenio 2010 CSD2009-00065).